Scientists at the Netherlands and Switzerland have created the world smallest electric car. Made from a single molecule, the nanotech car is around 1 nanometer long and uses electrons for fuel. 1 nanometer is 1 million times smaller than a dot or period printed on a piece of paper. This discovery can lead to a production of molecular sized robots or transporters that can move molecules around. The molecule sized machine is composed of four branches that act as wheels. They start rotating when a tiny metal tip delivering a small current is applied to them. Using 10 electric bursts of electrons, the nanotech car moved six billionths of a meter. Video: The Sykes Group at Tufts University explains the concept of a one molecule machine. The car was made to move in two ways. They adjusted the symmetry or "chirality" of the rotor parts and the nano-vehicle moved along a random path and also drove in a nearly straight line. 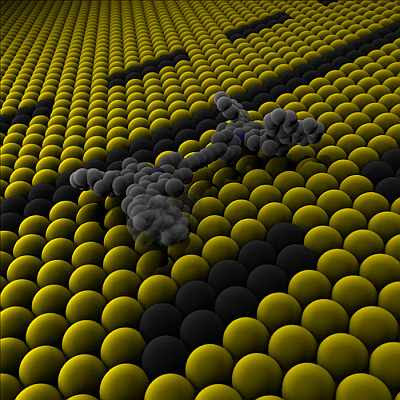 Ben Feringa of the University of Groningen and part of the research team explains, "The important step taken, in my opinion, is that we have shown that we can propel a single molecule along a surface and control directionality. 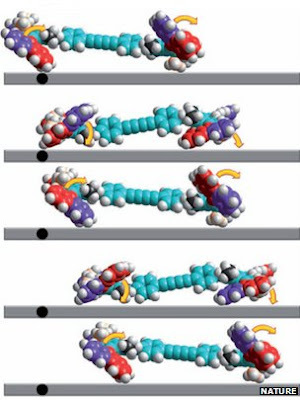 This is exactly what happens with protein nanomotors that 'walk' along filaments with control of directionality,"
The vehicle is constructed around an organic, carbon based frame. It is composed of four rotor parts or "wheels" connected to the body by a carbon-carbon double bond. Applying the metal tip of a scanning tunnelling microscope fires electrons at these bonds which break and re-form the other way round. This process is known as isomerization. This causes the wheels to turn, and the vehicle to move forward. Tibor Kudernac, a chemist at the University of Twente, the Netherlands, and lead author of the paper published their findings in the journal Nature. Scientists are optimistic that this demonstration is a step closer to molecular machines to perform specific functions inside the human body. Nanotechnology is starting to open paths to revolutionizing the medical field and other fields of science. Someday, diseases such as cancer can be cured using these kind of machines. Dr. Kudernac adds, "There are ways to play around. That's what we chemists do - we try to design molecules for particular purposes, and I don't see any fundamental limitations."